Cali Coastal Record Player Men's Tee. 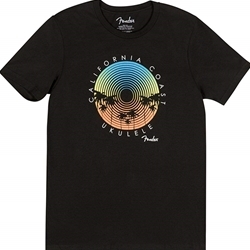 Capture the unique spirit and vibe of the California coast and show off your Fender fandom with this stylish and comfortable shirt. It’s made of 100% cotton and features an eye-catching vinyl record-inspired design that’s sure to make it a mainstay in your wardrobe.